Designed by Mikhail Tikhonravov's "kindergarten" team, the first manned spacecraft combined a spherical manned Descent Module with an unmanned Instrument Module and retrorocket unit. 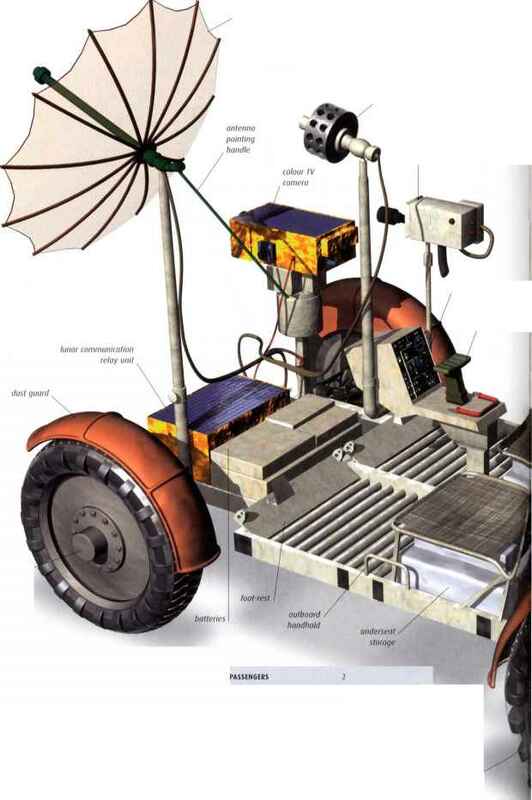 Unmanned versions were flown under cover of Sputnik launches 4 onwards (sometimes known as korabl sputniks, from the Russian for "ship"), and the manned spacecraft was launched half-a-dozen times. 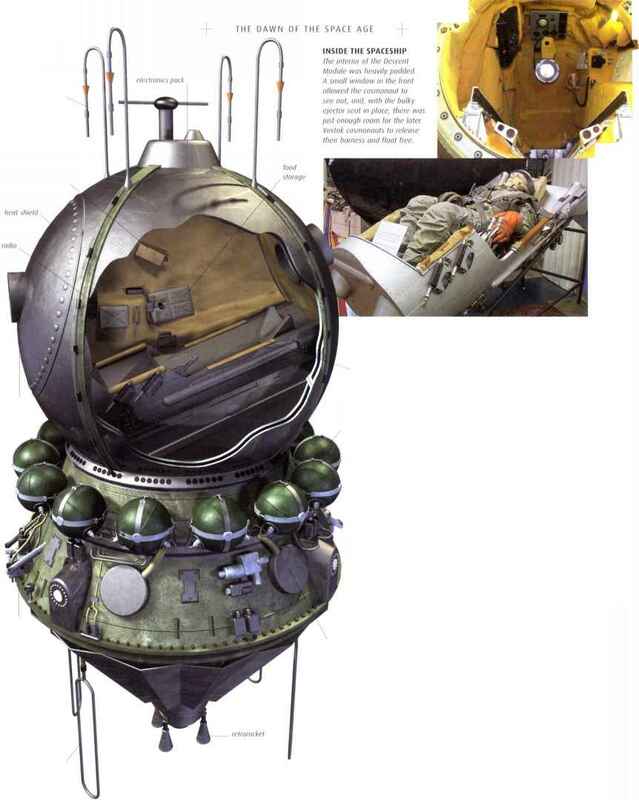 Although plans for later manned flights were scrapped, unmanned Vostok variants carrying reconnaissance cameras and other experiments continued to fly for three decades. The lower stages of the Vostok rocket were identical to those of the reliable R-7 Semyorka rocket, with four engine blocks powered by an RD-107 engine, surrounding a centrol core powered by the RD-108. Here, one of the side blocks is being attached to the core during assembly. Both engines were powered by kerosene and liquid oxygen. 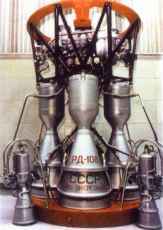 The RD-107 engine, developed by Valentin Glushko, used a turbopump to feed combustion chambers similor to those on the V-2. Four such chambers fed the four main rocket nozzles, while two gimballed vernier engines on the side helped steer the rocket. 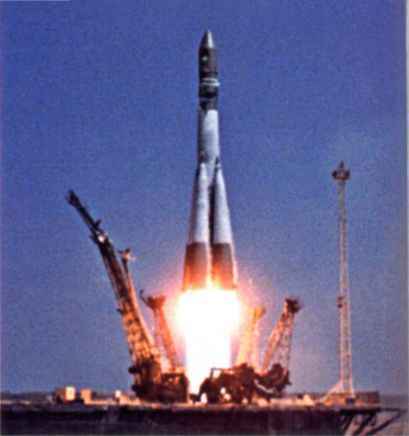 Support gantries fall away from each side of a Vostok rocket as it blasts its way into the sky. Flames from the exhaust are directed into the pit below, where they escape along tunnels so they cannot threaten the rocket. Dropping the Vostok spacecraft out of orbit required turning it around in space so it was facing backwards. Once the retrorockets had fired, the Instrument Module separated and the Descent Module plunged towards Earth. After re-entry, the cosmonaut ejected from the Descent Module and parachuted to the ground separately. The Instrument Module continued in orbit. 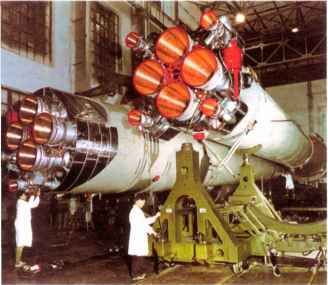 The 8K72K launch vehicle developed for Vostok used the lower stages of an R-7 with a 3 m (10 ft) third-stage engine similar to that used to boost the early Luna probes. The interior of the Descent Module was heavily padded. A small window in the front allowed the cosmonaut to see out, and, with the bulky ejector seat in place, there was just enough room for the later Vostok cosmonauts to release their harness and float free. The spherical Vostok Descent Module was weighted so that it tilted to re-enter the atmosphere with its heat shield leading the way. The Instrument Module was based on Tikhonravov's Object D satellite (flown as Sputnik 3). 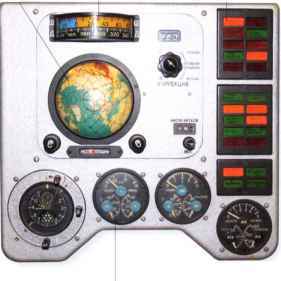 The Vostok controls were in two sections, of which this is the main one. In total, there were just four switches and 35 indicators - plus a hand controller for use only in emergencies. Cameras designed to trigger when the missile's engines fired captured the explosion and its horrific aftermath frame by frame. 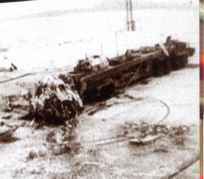 By the end, only charred wreckage of the R-16 remained. After a proud militory coreer that sow him fight against the fascists in the Spanish Civil War and command artillery in the Ukraine, all that remoined to identify Marshal Nedelin was his gold star as a Hero of the Soviet Union. The explosion laid waste on area 120m (400ft) in diameter. Many died instantly, but others were trapped by the fence around the pod. The fire raged for two hours before it could be brought under control. The explosion that rocked Baikonur Cosmodrome on 24 October 1960 was the greatest disaster in the history of rocketry, taking the lives of 126 Soviet space and missile personnel. It took many years for the truth about what became known as the Nedelin catastrophe to emerge - the Soviet state was habitually secretive, especially when it came to such sensitive matters. US spy satellites revealed that something had happened at the cosmodrome, but there was no way of knowing quite what - most analysts believed that, coming shortly after the failed launches of Mars 1 and Mars 2 and towards the end of the 1960 launch window for Mars, the explosion had been a disastrous third attempt to launch a Mars probe. 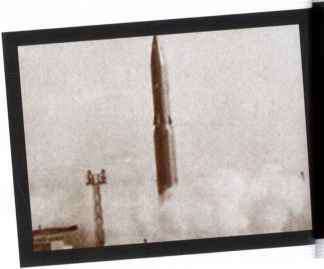 The reality was that the rocket at the heart of the inferno was a prototype Soviet ballistic missile, devised by Sergei Korolev's former deputy and now rival Mikhail Yangel. The disaster had been caused by the impatience of one man and a callous disregard for safety procedures. Once again, the Soviet Union had planned a spectacular, but this time things had gone very badly wrong. "Above the pad erupted a column of fire. In a daze we watched the flames burst forth again and again until all was silent the bodies were in unique poses - all were without clothes or hair. It was impossible to recognize anybody"
scaffolding dashed about in the fire and smoke; many jumped off and vanished into the flames." a request the previous day that the fuel should be drained and the rocket removed from the pad. When a further delay was announced, he insisted on going to the pad in person to see what was happening. With countless checks and procedures to run through in so short a space of time, something was more than likely to go wrong - and it did. At 18:45, the routine resetting of a timer in the command bunker caused the rocket's second stage to ignite, firing directly into the fuel-laden first stage below and creating a devastating fireball. Mikhail Yangel survived only because he was having a cigarette break with some colleagues at the time of the explosion. The incident robbed him of his ambitions to play a key part in the space programme, but the R-16 did make it into space, just over three months later in February 1961.
" ... people ran to the side of the other pad, towards the bunker ... but on this route was a strip of new-laid tar, which immediately melted. Many got stuck in the hot sticky mass and became victims of the fire." A present-day mop shows how Site 41 looked at the time of the disaster. 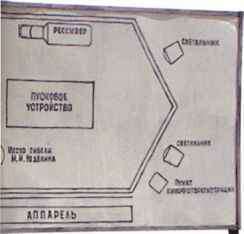 The R-16 stood at the centre of the hexagon, and the circle shows where Marshal Nedelin was sitting at the time of the explosion. "... a fire took place which caused the destruction of the tanks with components of the propellant. The casualties numbered up to 100 or more people including fatalities - several dozen. Chief Marshal Nedelin was present ... now, the search for him is going on." 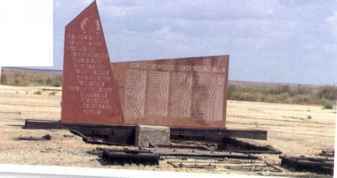 This memorial was only erected many years after the disaster but is traditionally visited by officials before every launch. Congress approves the creation of a National Aeronautics and Space Administration. NASA officially comes into existence. T. Keith Glennan publicly announces NASA's manned spaceflight programme, and the formation of the Space Task Group. The manned spaceflight programme is named Project Mercury, from a suggestion by Abe Silverstein. McDonnell Corporation is awarded the contract to manufacture the Mercury capsules. The seven astronauts selected to take part in Project Mercury are presented to the world. In late 1958, the newly formed NASA announced its manned space programme to the world. But while Soviet engineers could rely on massive rockets to go straight to orbit, NASA would have to proceed more slowly. Of course, some US engineers had been weighing the options for manned spaceflight since before the launch of Sputnik. Much of the early design work was done at NACA's Pilotless Aircraft Research Division, where forward-thinkers such as Maxime Faget and Robert Gilruth worked out a mission profile that involved lobbing a conical, wingless spacecraft into orbit, its underside fitted with a protective casing, called ablative shielding, that would burn away as it re-entered the atmosphere. Once it reached terminal velocity in the lower atmosphere, parachutes would bring it to a gentle landing. When NASA opened for business in October 1958, one of Administrator T. Keith Glennan's first decisions was to establish the Space Task Group, a panel of talented scientists and engineers inherited from the various bodies absorbed by NASA, whose role would be to make manned spaceflight a reality. Faget was among those selected in the group, and Gilruth was appointed as its chairman. Space Flight Center), they were determined to play a pivotal role in the US manned space programme, offering not just help in the design of launch vehicles to put men in Earth orbit, but a complete step-by-step plan to put Americans on the Moon by 1967.